Freight Hound is a powerful, professional web-based search tool which uses photos and an optimized database, providing access to every piece of OS&D freight on every dock in your system. Searching for lost freight has always been like looking for a needle in a haystack. split-second keyword search. It analyzes every piece of over-freight in your network and spits out the most likely matches along with photos and detailed descriptions. 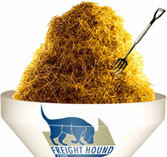 Freight Hound doesn’t do all the work; just the time-consuming, tedious, labor-intensive part. Simple Keyword searches enable employees to track down misplaced freight quickly and efficiently, often with customers still on the phone. While more indepth search tools allow them to refine search parameters by age, category, identifying numbers and origin trailer information. For instance, an OS&D clerk could search for every piece of overfreight found in the last 5 days on any trailer originating out of Chicago. The human brain can process an image and recognize an object in 150 milliseconds. (150/1000 of a seconf) The average American reads 200 words per minute. Based on these figures, you could have matched 80 shortages in the time it took to read this paragraph. Freight Hound resides completely on our secure servers, which means no software on your system. As a result, you save valuable server space and IT resources. We host all the data and compress all photos and documents to free up bandwidth and ensure locations with slower internet service are not left behind. Anyone with 56K internet service or better can effectively use Freight Hound. OS&D freight doesn’t care what color your trucks are or what mainframe operating system you use. It is lost and it needs to be found. The internet allows disparate users to share information across platforms and Freight Hound’s architecture allowing partner carriers to grant each other visibility to over-freight on both sets of docks. Whether your partners subscribe to Freight Hound or not, Freight Hound leaves no stone unturned.